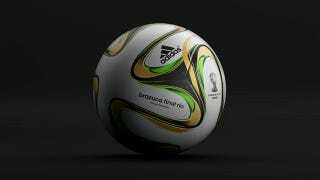 When the 2014 FIFA World Cup gets started on June 12 in Brazil, the world's greatest soccer players will be booting around one of the most advanced balls ever created for the sport — and the science proves it. Typically, soccer balls are made from 32 pentagonal and hexagonal panels. Recently, however, newer balls have featured 14 and 8 panel designs. But with this six-panel design, the ball is expected to exhibit optimal aerodynamic continuity and flight speed. Hong says the new ball has a "stable flight trajectory thanks to the shape and number of panels that it is constructed from." The characteristics of the panels on a soccer ball have a "substantial impact on how the ball travels through the air," Hong says. Hong and Takeshi Asai tested the balls by mounting them in a wind tunnel to test aerodynamic properties. They also used robots to kick the ball toward a goal 25 meters away and measure ball rotations, final impact point, and trajectories. Curiously, while Adidas has been steadily reducing the number of panels over the years, the scientists found that less isn't always more. While the six-panel Brazuca was the best performer, a conventional 32-panel ball followed it closely, the study says. Adidas is happy to forget the eight-panel knuckling Jabulani from the 2010 World Cup in South Africa—goalkeepers decried its fluttering and strikers lamented its inconsistency. The Brazuca and the 32-panel ball had "relatively stable" data, whereas other balls in the study differed greatly based on how the ball's panels were facing prior to the robot's impact. "The changes in the flight characteristics (points of impact) of Cafus and Teamgeist 2 with the panel orientation were particularly drastic, which indicated that their panel orientation significantly affected their flight characteristics," the researchers say. This all sounds great — but wind tunnels and kick-robots are one thing, actual game-play is another. I'm fully expecting the players to complain about it like they usually do. Read Newcomb's entire article. And check out the entire study at Nature: Scientific Reports: "Effect of panel shape of soccer ball on its flight characteristics."